Two years ago the UW launched a major, multi-decade Population Health Initiative. This coincided with an increased emphasis within our school, across all three campuses, on population health. The University has issued a Report to the Community highlighting the initiative’s initial impact and early successes. I would like to take this opportunity to thank Dr. David Reyes, assistant professor of nursing and healthcare leadership at our Tacoma campus, for his leadership on the executive council responsible for developing, implementing and measuring progress toward the initiative’s goals. He has helped ensure visibility for the crucial role of nursing to advance population health equity on a global scale. I want to highlight a few mentions of nursing in the report and highlight work happening because of this initiative. We were one of only three units selected to receive bridge funding for a joint faculty position (with the School of Public Health). This faculty position will be the catalyst that binds together multiple UW schools, departments and resources while leveraging a developing partnership with Public Health—Seattle & King County to address the Population Health Initiative’s grand challenges at a local level. The new faculty member will work to address the urgent need for better early childhood and youth interventions and would focus initially on King County’s Best Starts for Kids initiative. Best Starts for Kids is an initiative to improve the health and well-being of King County by investing in prevention and early intervention for children, youth, families and communities who are at risk for a host of chronic diseases. Recruitment for the position is now underway. Learn more about the bridge funding award and its execution. Dr. Barbara Cochrane is co-PI on “Addressing Health Disparities in Washington State: The Role of Social and Economic Inequities in Intersectional Marginalized Populations” brings together researchers from the schools of Medicine, Nursing and Social Work and the Evans School of Public Policy and Governance. Our school’s Community Health Nursing track within the Doctor of Nursing Practice degree program was renamed recently to Population Health Nursing to better reflect the current and future need for public health nursing expertise and an adapted curriculum. 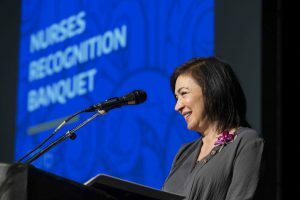 This name change reflects recent curriculum enhancements that deepen our school’s longstanding commitment to preparing nurse leaders to care for whole communities and populations. Students in this track learn to become leaders to work effectively with diverse stakeholders and communities. They also use skills in community assessment and engagement, policy and program development and evaluation, budgeting, and management to drive healthy change, policy, and high-impact solutions to health problems. They will have the opportunity to engage with many of the exciting projects and opportunities made possible by the Population Health Initiative. Learn more about the enhanced DNP-Population Health track. The goals of the Population Health Initiative are substantial and transformational. They fulfill the University’s desire that we Be Boundless and that we combine the knowledge and talent from every discipline to address the complex, interrelated issues involved in population health. There is widespread recognition that the SON, through our research and educational efforts, has a very substantial role to play in achieving the initiative’s goals. The quest for healthcare equity and global population health has begun, and we can take great pride in the contributions we are making. I hope the report serves as a catalyst. Think big. Think global. Think collaboratively. Think creatively. We can and will be leaders in this effort.